FANTASTIC FOUR #162 Page 30 Original Art. THIS IS YOUR OPPORTUNITY TO OWN A PIECE OF ORIGINAL COMIC ART HISTORY. 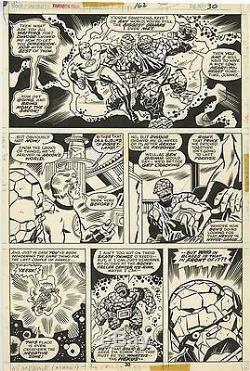 THIS IS AN ORIGINAL ART PAGE FROM FANTASTIC FOUR ISSUE #162 PAGE 30 WITH THE SPLASH SEGMENT ALMOST IDENTICAL TO THE COVER. THE ART IS REMINISCENT OF JACK KIRBY'S MAGIC WITH A CLASSIC LOOK AND STORY. REED RICHARDS AND THE HUMAN TORCH OF AN ALTERNATE EARTH, WHERE REED BECAME THE THING INSTEAD OF BEN GRIMM, VISIT ARKON'S WORLD. MEANWHILE, THE REAL BEN GRIMM TUMBLES THROUGH A NEXUS IN HYPER-SPACE. 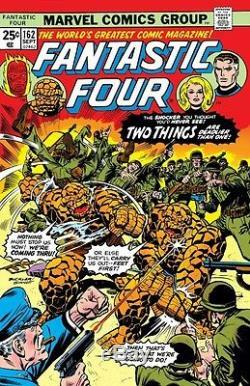 THIS IS CLASSIC BRONZE AGE FANTASTIC FOUR AT ITS BEST WITH ORIGINAL ART BY RICH BUCKLER AND INKS BY DAN ADKINS PUBLISHED IN 1975. THIS IS A GREAT PAGE WITH A VERY LARGE SPLASHY FULL TOP BOX FULL OF ACTION AS DEPICTED ON THE COVER. THIS PAGE HAS IT ALL GOING ON. IF YOU ARE LOOKING FOR A GREAT INVESTMENT QUALITY BRONZE AGE, VERY RECOGNIZABLE, FF ORIGINAL ART PAGE TO OWN THEN THIS IS YOUR OPPORTUNITY. The art is in excellent condition measuring 10 x 15 inches. COMIC IS FOR REFERENCE ONLY AND NOT INCLUDED WITH THE ORIGINAL ART. The item "FANTASTIC FOUR #162 Page 30 ORIGINAL ART 1975" is in sale since Thursday, October 13, 2016. This item is in the category "Collectibles\Comics\Original Comic Art\Covers". The seller is "gemcomics" and is located in Mattoon, Illinois. This item can be shipped worldwide.